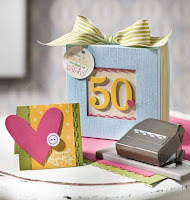 Craftin' Caro: Stop by at my Sale-A-Bration Open House this weekend! Stop by at my Sale-A-Bration Open House this weekend! Saturday January 30th will be my Sale-A-Bration Open House event, where you can stop by the studio and check out the latest sale that Stampin' Up! is offering! There will be new samples, doorprizes, a Make & Take for you to play with and more, so come on by... I'll be open from 10am - 5pm so be sure to stop in and say hello.